this weekend to wish us Happy Birthday! After we moved from Illinois to Eugene in 1967, the first vacation we took away from the Willamette Valley was to Sisters, Oregon. Sisters, in general – and the Camp Sherman/Metolius River area, specifically – had been highly recommended to us by friends in Eugene who spoke of it in almost reverent terms. We in awe as the clear, cold headwaters of the Metolius River gushed from the ground to form a full-grown stream. Our hike along the shoreline toward the hatchery was an easy and enjoyable stroll. We marveled at the steady downhill flow of the stream with its layers of rock, ripples and occasional pools – abundant with rainbow and bull trout. We enjoyed a picnic lunch in the shade of trees and paused to appreciate all we had seen and done. How blessed we felt to have visited an area that was easily accessible, but evoked a sense of remoteness – an area of preserved and protected natural beauty, yet open to all. We had 70 new bolts of Kaffe Fassett, Brandon Mably and Phillip Jacobs fabric arrive today! Here is Annette, getting it checked in and ready for the sales floor...I see a smile! Here is the whole group...I see some must haves! Check our website next week for updates! Freddy Moran is coming to Sisters! Jean was recently teaching in California. While there, she had the pleasure of spending some time with Freddy Moran. Jean was very taken with Freddy's new "collage quilts". Now Freddy will be joining us at the Stitchin' Post during Art Quilt Symposium week! 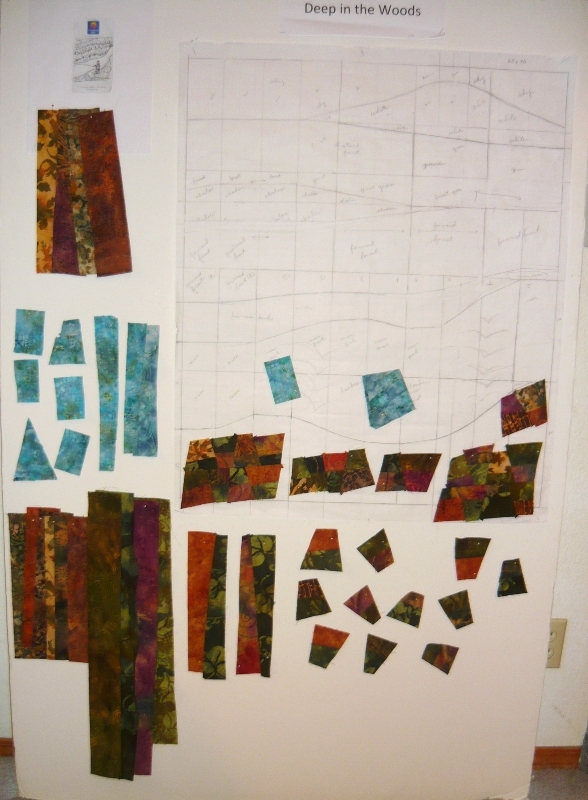 Freddy will be teaching a three-day workshop called "Patchwork Collage~Freddy Moran Style!" Freddy begins with a patchwork of black & white large-scale prints and then builds her collage from the background toward the foreground in bright, bold color. Click here for more details about the workshop! What fun to sneak a peek into a working studio that isn't "airbrushed" for a studio magazine. I like to see where REAL women create! "DEEPENING APPRECIATION FOR LOCAL RIVERS"
With Whychus Creek literally in our backyard, I have had an appreciation for this pretty little river. I love walking out there with my morning coffee, or watching with joy the pleasure it brings to our grandchildren who could spend the entire day throwing rocks and sticks on its banks. 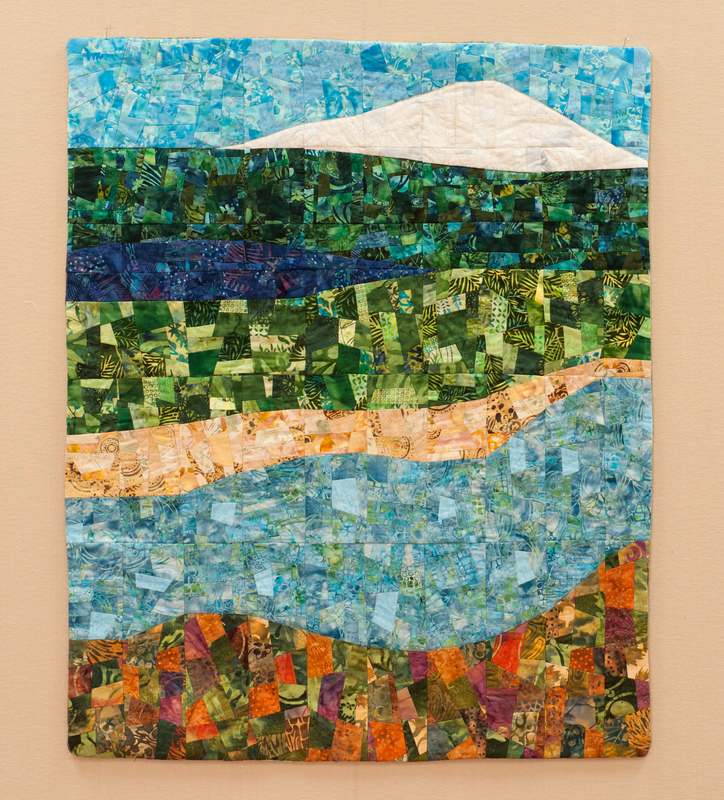 But it wasn't until I was honored with the invitation to be one of 19 very talented quilters to participate in the Quilt for Two Rivers project that I now really have a great appreciation for this river and all the rivers around us. It was so fun meeting at the Sisters City Hall that February morning and hearing Maret Pajutee of the U.S. Forest Service share with us all about this preservation and public awareness project.We caravaned together to a beautiful site only a few miles outside of Sisters and hiked a little-recognized river trail. All the raw, natural, untouched beauty so close to where we live was inspiring. We all took pictures and went home with greater awareness of the special qualities of Whychus. As I imagined what my quilt would look like, I just started sketching. 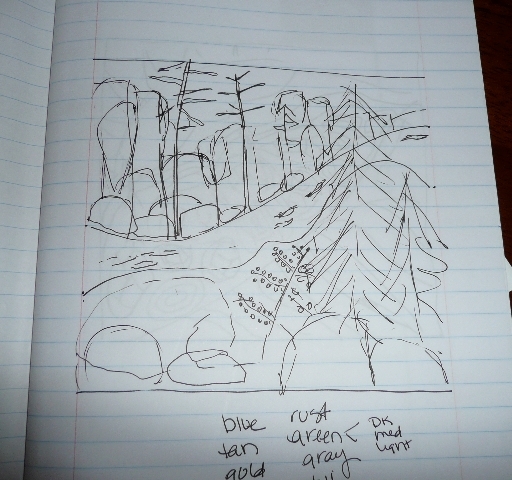 I sketched the trees along the river, dead ones, living ones, some erect, some leaning. And all the rocks --cliffs and those along the river's edge. The only two "givens" for each of us quilters were the tiny entrance and exit marks on the papers we received (so that the 40 quilts had the continuity of the river running through all the quilts), and the "river" fabric that we were to incorporate as a common element. And at the end I added fish in hopeful anticipation of their return to Whychus Creek!--Catherine MoenEnter the Name the Quilt Facebook contest! Visit https://www.facebook.com/pages/Quilt-for-Two-Rivers/132757123491016?sk=app_95936962634 to view current entries for the contest, with a grand prize of $100 cash and a discount lodging package at FivePine Lodge in Sisters, Oregon. Entries being accepted until May 18, when finalists will be chosen. Then Facebook fans will vote to select the winning name during the voting period May 22-25. I’ve been sewing clothing since I was eight years old. Educated as a nurse, I’ve always like sewing and weaving blankets, imagining that my textiles are surrounding ones I love with love and comfort. Maintaining bluebird trails in Sisters and Eugene, my two homes, is my favorite outdoor activity now. My favorite Oregon rivers include the Rogue, McKenzie, and Umpqua. Hiking along the Metolius is magical – seeing the spring gush from the hillside is always a wondrous sight. And now Whychus Creek has become very special to me. Watching the recent video of Whychus Creek flowing anew through Camp Polk meadow as part of the restoration work inspired hope. We’ve tried to control nature – often causing unfortunate outcomes for wildlife. Knowing salmon are back in Whychus is exciting. 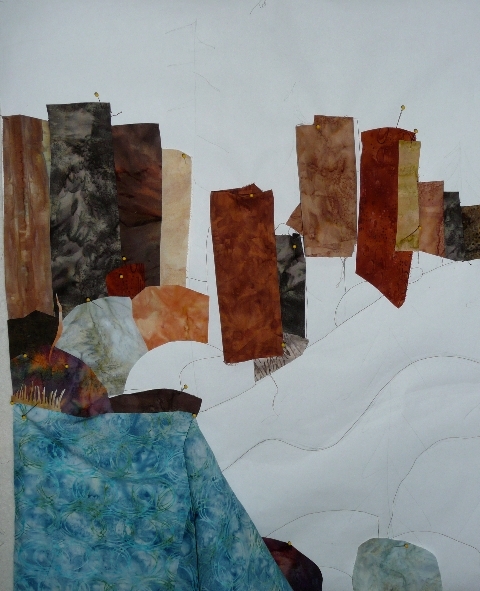 Making nature quilts I look at wilderness through a new lens. What color is the McKenzie this spring? Gray green? What colors are the mountain trees? Blue green? Brown gray? What fabric in my stash would mimic what I see? How high is the flow? How would I create that log that floated down in a flood? How does the water flow around that rock? How do the branches of that pine differ from Douglas fir? What stitches would enhance the design? 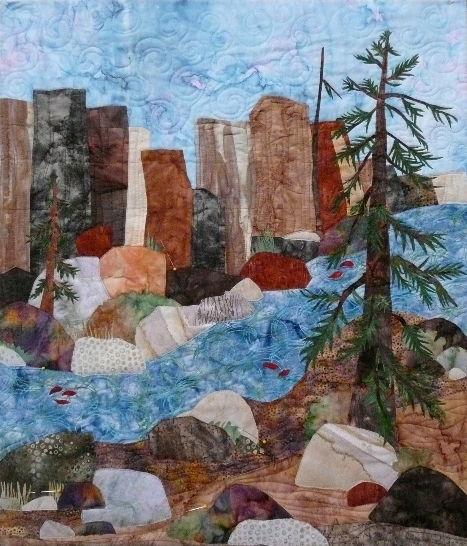 I am thrilled to participate in the Quilt for Two Rivers project. I love combining my love of nature and rivers with textiles. I’ve long thought there’s not a problem in the world a little sewing can’t make better. I’m glad Q2R is raising awareness and financial support for two rivers I love. This new line of fabric from Moda just arrived and its cute as can be! There is a fabric panel for making a soft counting book for little ones. Inside the book there are panels made with "chalkboard" fabric for practicing how to write numbers! The finished book has a zippered pocket on the outside for holding necessary chalk and an eraser cloth. What a fun project!